Ms. Yingling Reads: Fantasy books everywhere! A reminder: I am a school librarian, so everything that I do with books ultimately circles around to getting "The right book for the right child at the right time". I spend my days talking with students about what they want to read and how they liked the books they've read, and I spend my evenings reading and researching the books that have been published. No matter how good a book is, or how much I love it personally, if I can't think of students to whom I would have a book, it does not make sense to use my limited monetary resources to by it. Books collecting dust on the shelves is the saddest sight, as well as a waste. There are a lot of fantasy books published. I don't know the percentage of all middle grade books published that are fantasy, but for last year's Cybils' award, 109 middle grade realistic fiction books were nominated to 115 speculative fiction ones. In addition, the librarian before me was very fond of fantasy, and my collection is rich with almost 50 years' worth of fantasy titles. Finally, I've had fewer readers requesting fantasy books in the last five years. Granted, fantasy readers are often insatiable, but they are often also very specific about what they want. In short, I don't buy many fantasy books, although I do take a look at many of them, just in case. Here are some titles that I've read, but won't be buying. Unless, of course, this year's class of 6th graders burn through all of the fantasy titles I have! 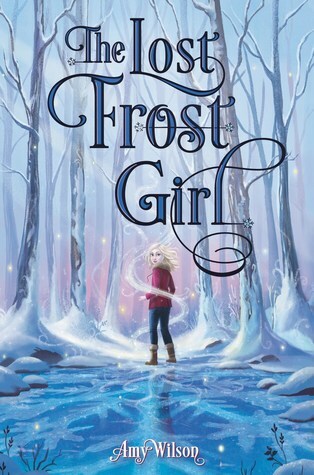 "From debut author Amy Wilson comes a story brimming with heart about a normal girl who discovers that she is really Jack Frost’s daughter—with winter powers of her very own. The Lost Frost Girl is an enchanting modern-day fairy tale about family, friendship, and the magic of embracing who you are meant to be. Owl has the kind of mom who would name her Owl, a dad she’s never met, and a boy who gives her strange looks at school—but Owl has come to accept that this is as normal as her life is going to get. Until Owl finds out that she is Jack Frost’s daughter. Determined to meet him, Owl delves into Jack’s wonderful world of winter and magic—the kind of place she thought only existed in fairy tales. And as she notices frost patterns appearing on her skin and her tears turning to ice, Owl starts to wonder if being Jack Frost’s daughter means that she has winter powers of her very own." This is the strongest contender for one I might purchase. It starts in the "real" world, has a few friend and family problems, and has a fairy/folk tale connection. Still, the same can be said of Houts' Winterfrost, Prineas' Winterling, Constable's The Wolf Princess. or Rudnick's A Frozen Heart, none of which have been circulating very well. "Obert Skye, author of the bestselling Leven Thumps series, delivers a delightful mixture of offbeat mystery and laugh-out-loud humor in this thoroughly inventive adventure complete with comic-style illustrations, the first in a trilogy. 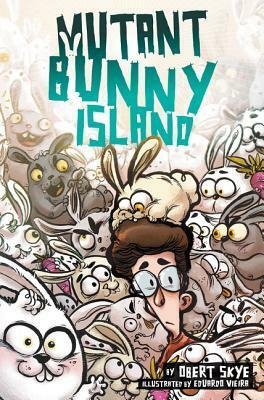 On his own, Perry travels to Bunny Island, where dozens of bunnies are running wild. One in particular doesn’t seem quite right. A creature this cute shouldn’t exist in nature. Are there truly evil newts on the loose, or something much stranger...and more disturbingly adorable?" You'd think this would be a slam dunk, with the graphic novel style pages, and, you know, mutant bunnies, but my fantasy readers don't seem to like graphic novels, and my graphic novel readers don't like fantasy. (Hence, Faith Hicks' Nameless City collects dust, even though it's very well done.) This was also on the elementary side of the Pilkey line, and my readers tend to skew more toward YA when it comes to this genre. Luckily, the few ardent Skye fans I've had frequent the public library, so they can pick this up there if need be. Cyprus, Naomi. Sisters of Glass. "Two girls. Two worlds. Only magic can bring them together, in this fantastical middle grade adventure for fans of the Descendants and School for Good and Evil series. One girl fears magic, one worships it. 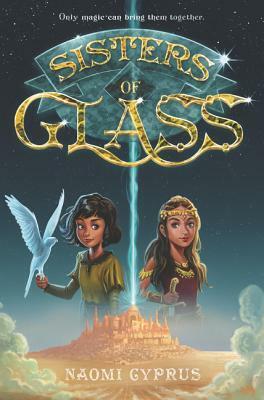 But when a legendary mirror connects them, Nalah and Halan finally meet—and must work together to save their two worlds, before everything they know is shattered forever."